I'd like to add a transmitter for FPV for my Meh DJI Phantom 1.1.1 and was wondering what the current good options are. Aside from avoiding 2.4GHz, what else should I know? I'm now looking at upgrading to 3D. Looking into more information on this 3D FPV camera The BlackBird and sources other than Russia for all of the parts including goggles. @DJMajickMan I'm seriously considering the skyview 3D glasses. I just am hesitant because it's $530, but it does come with stereo camera and 2 channel transmitter. @DJMajickMan yeah that's what I meant.. thanks! I should have mentioned, I currently have a GoPro clone with video out, so what I'd really like is a Tx/Rx setup where I can initially use the GoPro-ish for FPV, but later can run a separate FPV camera. So what I'm looking for is the easiest to wire / simplest to run Tx/Rx combo that I can plug whatever camera into on the quadcopter side, and whatever display (goggles, TV, immersive holodeck environment from the future) into the Rx side. I kinda know nothing about the options, and when I hit google I get posts from the dawn of RC to the present, so it's hard to figure out what are the, say, three most common setups in current use. @zippyus than first you need to find out if your clone's video out has a cable available that either alreday exists or can be spliced to work. than get http://www.amazon.com/gp/product/B00BW7HS00/ref=oh_aui_detailpage_o03_s03?ie=UTF8&psc=1 of you want iOSD get that while you're at it. next you'll need either the same goggles i listed, or another fatshark pair, or maybe http://www.amazon.com/gp/product/B00J4ZYPCG/ref=oh_aui_detailpage_o06_s00?ie=UTF8&psc=1 if you don't like goggles. @DJMajickMan it's the SJCAM SJ4000 (non-wifi model). Has one HDMI D (Micro) output. So now I realize I either want an HD to AV converter, or a transmitter that can handle digital input. @zippyus It's easy peasy now! You can choose any TX/RX you want and get one of those USB to JST cables. @ruouttaurmind Can you find me an av cable for the AEE S71? I have no luck finding it and have no time to make one. @zippyus are there any delays from the GoPro'ish video out? @garyhgaryh I'll poke around and see what I can dig up... What side of the camera is your USB on? @sportykev As fate would have it, I happened across this latency test video last weekend. @ruouttaurmind If you're facing the camera, the left side. @garyhgaryh Opposite the gimbal motor. Perfect. Let me see what I can turn up for you. @ruouttaurmind ok great! I wonder if @puffyfish (did I get his name right) get anywhere. I got the gopro 3 usb cable. I thought I would be able to solder extra wires to the pin but it's siliconed. I guess I can take it off and try but rather buy a cable than to tinker around. @ruouttaurmind wow bud, this contradicts the pinouts I have: where did you get this image? Does AEE sell the cable? @ruouttaurmind btw, thanks I appreciate this info! @garyhgaryh YW. Glad to help. I got that diagram from a French drone site. The person that posted it says it was provided and confirmed by AEE engineering group in Hong Kong. They do not make the cable. But I can make that. Easy. Using these connectors from eBay (10 for $5 from China) I think the key is to remove pins 7, 3 and 8 to allow easy access to pins 9, 5 and 10 to solder without shorting to neighboring pins. Short 1" jumper from 5 to 10, two leads out, little heat shrink tubing and done done and done. @ruouttaurmind Hey I'm looking carefully at both of the image (the one I got and the one you just posted). It's the same! The pins are just numbered differently so it looks like the same info (collaborated). You have the url where you got the connectors? Interested in making one for me? I'll pay ya :). @garyhgaryh I'd be willing to give it a shot. One each for you and Puffy to try. @ruouttaurmind that's great if you make one for us! I just ordered the connectors too! Thanks! @garyhgaryh Gary, are you wanting audio from the AEE VTX feed, or is video alone sufficient? @ruouttaurmind video is good enough. @garyhgaryh That was fast. I already received the 10 pin mini USB connectors I ordered from China. So I'm going to give it a shot (building a FPV cable for AEE cam) and need to know if you want the leads to be bare, or if you want female JST connectors on them? Oh, and about how long do you need the leads to be? @ruouttaurmind Wow great! You can put a female jst connector on there. I plan on putting jst connectors on all my simple connections so I can just plug/unplug things vs soldering. Wow, I can't believe you got it so fast! @ruouttaurmind Yeah, that's the right connector that should go into the AEE S71. Want a picture of it? I looked at a motorola connector I use to charge it and it's slightly different.. but yours should work I think. @garyhgaryh Oh, that's good news! When you have time, please post a pic of the AEE side. I was hoping to fiddle with the output on the Vivitar and figure out live analog video, but I'll have to keep searching for that other kind of 10 pin USB. @ruouttaurmind I'll do this on Wednesday (today). I need to go to sleep :). @ruouttaurmind Here's a picture of the connector. I use a motorola micro usb cable for their phones and it fits. @garyhgaryh Definitely the connectors I received. I'll get cracking on making a cable this weekend! It'll be awesome if it works as planned. @garyhgaryh Any chance at all you still have the parts to make another one of these cables? I have the same AEE S71 camera and am looking to add the video out to my 3-way switch so I can fly with the FPV cam, lock GPS, switch to S71 gimbal cam and get a little better look at things I'm inspecting on our jobsites. If you do let me know and if not, at least now I know it's possible and you've provided just enough detail for me to "attempt" it myself. I'm descent with the soldering iron, but this will certainly test my limits. Thanks in advance! Seems like I keep pushing the Bascom vtx/vrx. The whole fpv setup cost me about $100. Now I want goggles, but that's gonna most more than the p1.1.1 itself plus the fpv. The mini iosd was a nightmare to get going on this quad but its all done now. I also found a set of fatshark additudes and imerson 600 tx, for $275. 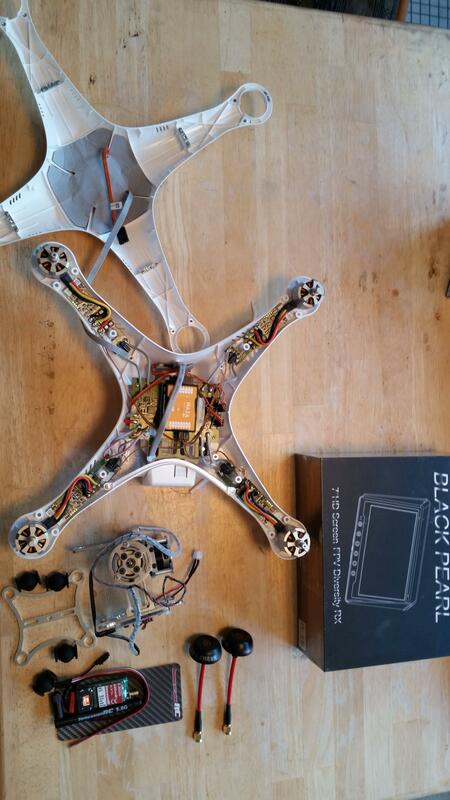 Honestly your best bet for fpv will be a imerson 600mw tx and black pearl monitor/rx. @nltownsend843 tell us about the iosd mini upgrade. How much did the upgrade osd upgrade mod run you? I'm looking at osd's now. You can get an osd for as cheap as $18. Oh man its a long story lol. I ended up getting the dji iosd mini ($69), and the v3 upgraded main board ($70) the upgraded main board has a built in pmu, easy would be to add the iosd and a pmu v2 add on box, but thats just more weight, so i did the board. Thats the easy part, hard part is the iosd needs a can bus port to work (there are hacks for the p1 board, but i didnt do that),the v3 version of the updated board does have a can bus but its not the same plug as the iosd, i found several pinouts online, but they were all wrong, i ended up figuring it out myself. @nltownsend843 If you can make a video or writeup of what you've done that'll be great! No pressure though just that I'm amazed you got it to work. Seems like you spent a pretty penny to get osd. Yeah it started out as buying the iosd mini thinking it would be plug n play, after i found out it wasnt i was damed and determined to make it work as close to oem as possible. I think i read the problem with the cheaper osd is they wont display all info, i dont remember if it was battery or gps they didnt show, but it was something like that. I do have a couple pictures of the set up now though. @nltownsend843 Did you follow this for installation of the Canbus? or is it completely different? I found about three writeups for the can bus online and they all had the wrong pinouts for the main board and iosd mini. Its also note worthy that this updated main board has a built in ccontroller for a zenmuse gimbal and video out to run to the transmitter (when using a zenmuse) so you could buy a zenmuse gimbal without a controller cheaper and plug it into this board if you wanted. @nltownsend843 http://www.dji.com/product/zenmuse-h3-2d/video sorry about that don't know what happened to it. If it goes away again search for "How to install the Zenmuse H3-2D On Your Phantom-0"
Kinda but different, all those extra boxes they installed are built into the updated main board, swapped in the new board and built a custom patch cable to get can bus to fead the mini iosd. If you went the route in the video and wanted telemetry you would have three extra boxes crammed in the phantom, the pmu v2, a gmu for the gimbal and a iosd for telemetry. @nltownsend843 Since I have the dual battery mounts I no longer use the battery bay so I plan on cramming it all in there. :) Also I plan to eventually add the datalink kit. Id be more concerned about the weight than the room. @nltownsend843 these items don't add up to that much weight and I've already upgraded to the 9443 carbon fiber props. With dual batteries I already get longer flight times. Another thing to consider is to do the add ons you'll have to buy two modules at ~$70 each, the upgraded board has those built in for $70.....i boils down to if you want to spend double for a slightly easier install. @nltownsend843 What is the board you replaced? Just looking through parts on their site. @nltownsend843 Can you take a close up picture of how you attached your CAN bus? I opened mine up last night to install my Gimbal and it didn't look the same as what I was expecting from the directions found here http://www.sarawuth.com/2014/01/dji-phantom-1-modify-to-have-can-bus-port/ This is what mine looks like. Thats because you have the original p1 main board in yours, i remember seeing ways to hack your board online. i didnt read the link you posted but looking at the picture, he has a version 2 upgraded board you have to solder wires to it for canbus. The updated board i bought is version 3 it has a place to plug in canbus but you have to build a custom cable. Ill see if i have a picture. Heres a thread showing the board......but dont folow the pinouts listed, i found they were wrong. @nltownsend843 Okay purchased the upgrade board from China. Was cheaper than buying the one from Australia due to shipping. @nltownsend843 That took forever to get in but now with it finally installed I now know what all the extra cables were for on the video out cable I bought for my GoPro. Now I just need to resolve the CAN-hub not working. It looked like the leg CAN-hub should have just plugged into the board but it's not working so I may still have to solder it to the board. It should just plug in. The pin out is probably different. I should have a diagram i drew out at home, ill try to remember to check. I think there was a video posted in this thread (maybe by you) that showed the can hub on the leg being pinned different. @nltownsend843 Okay found that post and it looks like the pin out is reversed. Going to have to see if I can pull the pins from the connector and reverse them, or I'll have to do like they did and cut and splice them together in the correct order. Why DJI? Why couldn't you have pinned it out to match? @nltownsend843 Custom cable completed and we are go for FPV flight with can hub and ground station attached. Photo to come later. Thanks for all the replies. I'm going with the immersion 600mw tx and a black pearl display/rx. And after that, probably osd. Currently intrigued by the minimosd which has open source software to talk to the Naza. @zippyus thats the same setup i have on mine.....be aware its a task to put the iosd mini on a p1 but it can be done. @nltownsend843 iosd is dji's module that needs canbus? @zippyus I have no idea why I just read that as "it needs cannabis". Parts arrived. Here goes my weekend. Thats a 30 minute job lol. @zippyus What a lovely gimbal! Looks just like mine. Yeah, it shouldn't take that long. Less than an hour which includes setting up your area, unpacking, etc. I drilled a hole in the body to pass the tilt wire.